Difficulty swallowing food or the sensation that it’s stuck in your throat or chest can be a scary feeling. 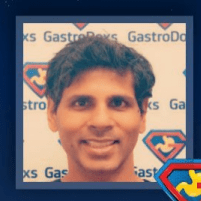 This is a medical condition called dysphagia, and Dr. Bharat Pothuri is a gastroenterologist at GastroDoxs in Cypress, North Houston, Texas, who specializes in diagnosing and treating dysphagia in Greater Houston. If swallowing is difficult or painful each time you eat or drink, call or schedule a consultation with Dr. Pothuri using the online booking system. Occasional pain or trouble swallowing when you eat too fast isn’t cause for concern. When it happens regularly, or it’s so painful that you’re unable to eat well, it could be a sign of dysphagia, a more serious condition that requires treatment. Dysphagia is most common in older adults, but can occur at any age for numerous reasons. Esophageal dysphagia feels like food gets stuck in your throat or chest after you swallow. This type of dysphagia is usually the result of structural causes that narrow your esophagus, typically because of scar tissue from acid reflux disease, inflammation, or tumors. Oropharyngeal dysphagia makes it difficult to move food from your mouth past your throat and into your esophagus as you begin to swallow. It’s typically the result of neuromuscular issues involving nerve damage or another health condition that prevents the brain from communicating clearly with the nerves at the top of your esophagus. If you are unable to swallow or are having difficulty breathing, get immediate emergency medical attention. For other persistent symptoms, make an appointment with Dr. Pothuri so he can determine the cause of your dysphagia and offer effective treatment options. In rare, severe cases that don’t respond to medications, surgery, or dilation, liquid diets or feeding tubes help you get the nutrition your body needs.